Every meal at Gakusei Kaikan is hand cooked by the dorm mother with her whole heart, based on recipes created by a professional registered dietitian. 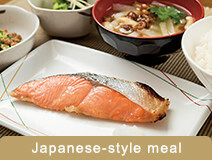 So, homey warmth and balanced nutrition coexist in meals enjoyed every morning and evening. We support students’ healthy daily lives with these loving meals. Two meals, breakfast and dinner are included in rents. A registered dietitian plans your daily menus, considering students’ opinions. In addition to the taste, the dietitian considers also the nutritious balance for your meals, so that you will be able to spend a healthy college life. The meals come in a wide variety to avoid putting students off their food by eating the same things every day. Focusing on seasonal ingredients, we try to offer delicious in-season food. Ingredients are delivered in a refrigerator truck to each Gakusei Kaikan every morning, so that the ingredients are kept fresh and tasty. To deliver fresh ingredients with quality, we persistently make good use of freezing and refrigerating techniques for transportation. Of course, food safety and the hygiene situation are also well managed. 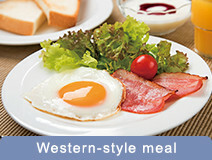 You have a choice of 'Western-style meal' or 'Japanese-style meal' every morning. 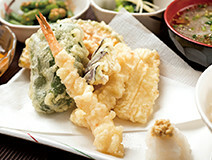 Our pride is the variety in our menus.You can eat as much rice and miso soup as you desire. - Girl A and Goy B - to see what big differences meals can make in their future lives. We took polls from students about their favorite menus. 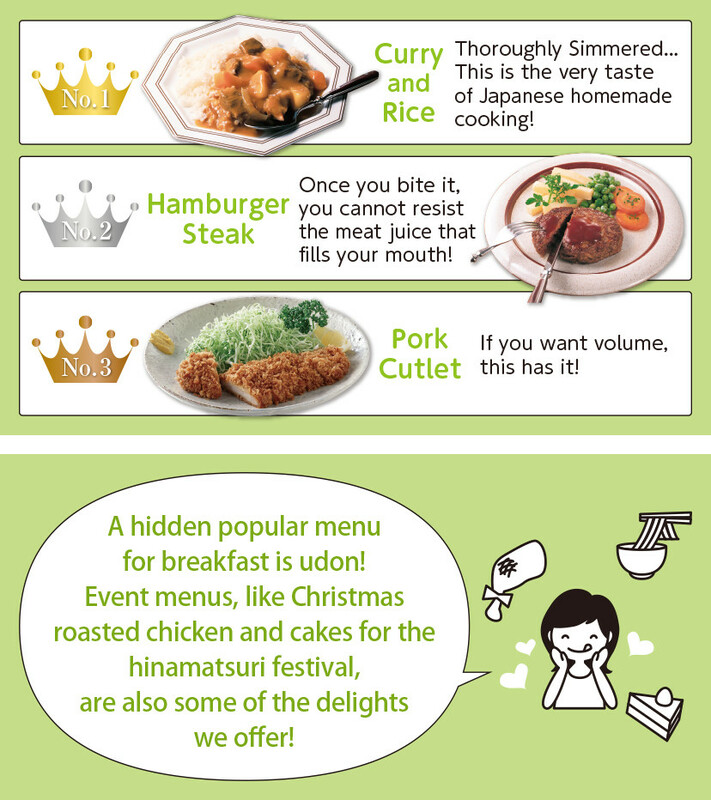 Curry and rice took the first place, as expected! Its taste and unlimited helpings gathered the votes of big eaters. 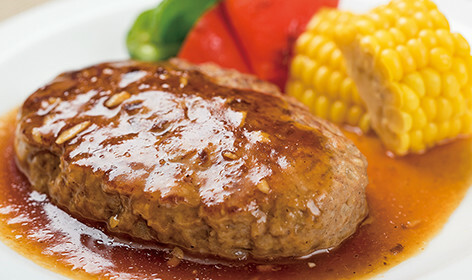 Then, hamburger steak and pork cutlet followed. Both meals are very popular classics! You will feel secured even when you catch a cold. 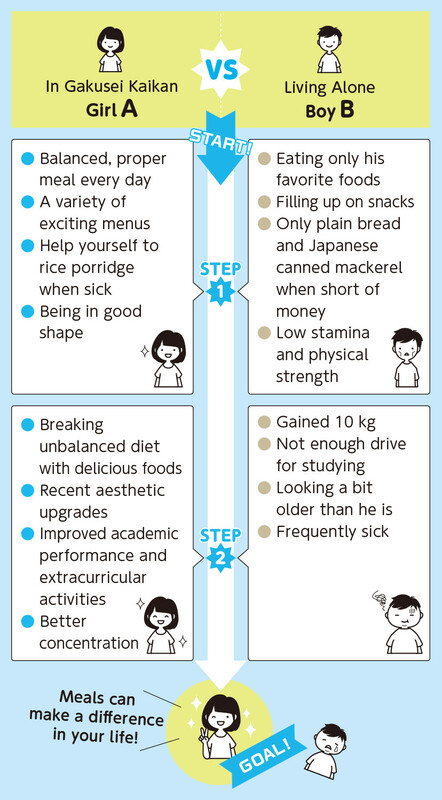 Dorm Mom will hand cook rice panorridge to help you recover quickly. Thorough countermeasures are in place including provisions of disaster prevention equipment and AED and organization of fire drills, with Mr. and Mrs. Managers playing a central role, to prepared for every eventuality. The Manager and Dorm Mom are also living in Gakusei Kaikan to support your peaceful living. When you are sick, they will take you to a hospital, and when a package is delivered while you are out, they will receive and keep it for you. In addition, crime prevention measures are perfectly taken, including the auto-lock system at the entrance. Moreover, the entrance is equipped with an auto-lock system and crime prevention seminars are also organized. With full-time support by Mr. and Mrs. Manager, the crime prevention measures are perfectly taken. A 24-hour medical consulting service. Doctors and nurses will sincerely advise you. Gakusei Kaikan Is a Fully-equipped Facility! The facility is fully equipped with furniture and other equipment necessary for students’ everyday lives. All you need is a bag of your belongings to start immediately your new life in the dormitory. Thus, you do not need to move a lot of luggage and it is very economical. 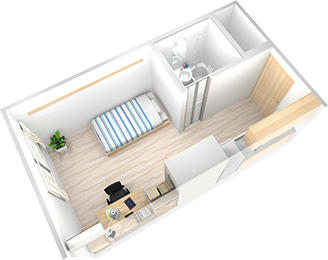 Necessary facilities, including dining and laundry rooms are all within our dormitory, so you are secured with ample room for yourself, and less bothered with cleaning.